The LG L90 is the flagship handset for the Korean firm's third generation L-series range of budget focussed devices, bringing with it the latest version of Android and a decently sized screen. Rocking up with a 4.7-inch display the L90 gives you enough real estate to play with, although at a resolution of just 960 x 540 it's certainly isn't the sharpest screen you'll lay eyes on. This gives you a clear indication pretty early on that the L90 isn't a high flying smartphone, although it does borrow its styling from the flagship LG G2 and substitutes the on screen navigation bar for below the display buttons. The addition of the physical keys adds some extra length to the handset, but the L90 still sits comfortably in the hand with the textured rear cover providing a suitable level of grip. It is a solid, well built device - but it is quite obviously an all plastic construction to help keep the yet unkown price down. An easy to reach power/lock key resides on the right of the LG L90, while on the left you get the equally well positioned volume rocker switch. 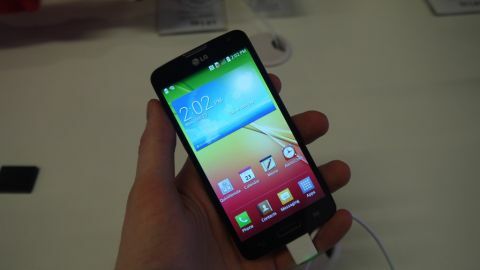 There's a little surprise on the top of the L90, as LG has included an IR (infra-red) blaster on the handset. This means you'll be able to control home entertainment products such as TVs, DVD players and set top boxes with the LG L90. This functionality is usually reserved for higher tier smartphones, so I was pleased to see it sitting happily on the L90 and the intuitive application makes it easy to program the phone to control your other devices. Another feature I was pleased to see on the L90 was the latest version of Google's mobile platform - Android 4.4 KitKat. LG has stuck its own overlay on top of Android, bringing with it the firm's new security feature dubbed Knockcode. Knockcode allows you to wake the screen and unlock the L90 by tapping out a code of between two and eight "knocks" - a feature LG is rolling out to its entire fleet of new smartphones. I found Knockcode was a little hit and miss as at times the L90 didn't register my taps, but if LG can improve accuracy I can see it being a rather useful feature. Moving around the L90 was pretty smooth and I didn't really experience any lag, although it's not exactly a high-octane performer. With a 1.2GHz quad-core processor and 1GB of RAM the LG L90 is well enough equipped to cope with most things you throw at it. The 4.7-inch qHD display is good enough for viewing images, browsing websites and reading messages, but you'll probably want to avoid watching movies on the L90 as the quality isn't overly fantastic. That extra screen space does mean there's plenty of space for the keyboard, and I was able to tap out a missive at a decent pace without any errors popping up. The 8MP rear camera is handy for the odd photo here and there, and it is capable of taking some nice snaps - but it misses out on the extra features of LG's flagship devices. The LG L90 is a well equipped smartphone, if a little unspectacular, and if you're looking for an Android run-around with a large(ish) screen and the latest software you won't be too disappointed.